Carrier heat pumps have a reputation for efficiency, high quality and durability. From the top to the bottom of the line, they are the highest-rated heat pumps in the industry. In this overview of Carrier heat pumps, you’ll get the details on each of the lines. 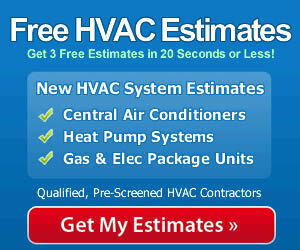 Carrier heat pump prices are found below. For head to head comparisons, see our heat pump reviews. We include HVAC prices in all our reviews, so you’ve got the details you need to make an informed decision about your next heat pump. Carrier has 3 lines of heat pumps, the top-rated Carrier Infinity heat pumps, the Performance/Comfort line and the Carrier Base line. The fact that all of the lines are covered by the same 10-year compressor and parts warranty shows the depth of the collection. Carrier Infinity heat pumps: The head of this class is the exciting Carrier Infinity Greenspeed heat pump, also known as the Carrier 25VNAO. It has a modulating compressor, so it heats and cools in increments of 1%. It runs between 40% and 100%, determined by the exact capacity required to keep your home comfortable, with almost no fluctuation in temperature. It’s one of only a handful of modulating compressors in the industry. Here’s the rest of the lineup: Carrier Infinity 25HNB9 (19 SEER /10.0 HSPF), Carrier Infinity 25HNB6 (17.2 SEER/9.6 HSPF), Carrier Infinity 25HNB5 (16 SEER/9.0 HSPF), and the Carrier Infinity 25HNA9 (19 SEER/9.5 HSPF). All of these are 2-stage heat pumps with different efficiency levels to match various climates. Carrier Performance/Comfort heat pumps: This “second best” group is quite impressive. It contains several 2-stage models and more affordable single-stage models, but they are ALL Energy Star rated. The quality is just a short step down from the Infinity Series models. The Performance/Comfort heat pumps are the Carrier 25HPA6 (17 SEER/9.0 HSPF), Carrier 25HCB6 (16.5 SEER/9.5 HSPF); Carrier 25HPA5 (16.5 SEER/9.3 HSPF), Carrier 25HCC5 (16 SEER/9.0 HSPF), Carrier 25HCB3 (15.5 SEER/8.8 HSPF), and the Carrier Compact 38QRR (15.5 SEER/9.0 HSPF). Carrier Base heat pumps: These 2 single-stage heat pumps are also Energy Star rated and offer a low-cost alternative. They are backed by a 10-year warranty and should last 15-20 years. The efficiency level makes them a good choice for moderate and warm climates, but not very warm regions. Carrier Base heat pumps are the Carrier Base 25HBC5 (16 SEER/9.0 HSPF) and the Base 25HBC3 (15 SEER/8.5 HSPF). Which Carrier Heat Pump Should You Choose? Performance and efficiency differences characterize the Carrier heat pump lineup. If very hot climates, the more efficient the heat pump is, the less energy it will use and the less you’ll pay in utility bills. However, the cost of the heat pump will be higher, so it takes doing some math to figure out how long it will take for the lower utility bills to allow you to recoup the extra expense. This is known as your “payback” period. Many of the Carrier Infinity heat pumps are dual fuel capable. This means that they can alternate heating with a gas furnace, based on the outside temperature. When it’s below freezing, a heat pump won’t work. Above freezing, a heat pump is more efficient than a gas furnace, producing lower utility bills. Choose a dual fuel model in cold climates and get lower energy bills than you can get with just a gas furnace. For moderate and mild climates without extreme temperatures, the Performance/Comfort and Base lines are worth a look. In terms of comfort, the Infinity Greenspeed offers the best climate control including balanced temperatures and humidity reduction when in cooling mode. Two-stage heat pumps are quite comfortable too, but with single-stage models you might experience slight temperature changes between cycles. You pay more for high quality – and you might pay a bit of a premium for the Carrier brand name. Carrier does have a top-5 service record, so you’ll get dependability if the unit is properly installed. Here’s an overview of pricing. Heat pumps come in sizes from 1.5 tons to 5.0 tons, and that, among other factors, is reflected in the price ranges. For quality and performance, you can’t go wrong with a Carrier. It might be worth your time to compare this lineup with other top brands like Lennox, Trane and American Standard. Search our site for individual reviews on many of these models to learn more details and get exact pricing. For the best pricing where you live, get multiple estimates from certified Carrier dealers. Then, because installation is a vital part of how well a heat pump will perform, choose the qualified contractor you believe has the skill and experience to do the job right the first time.